So the holidays are over, nothing but a couple of months of winter left staring you in the face, and the question on everyone's lips: "What do I do with these damn kids now?" You could do worse than taking them to see the Pittsburgh Musical Theater production of The Little Mermaid. Based on the 1989 Disney film (which in turn was based on the Hans Christian Andersen fairy tale about a young mermaid who longs to become human), the Broadway musical opened in 2008. Coming after blockbusters Beauty and the Beast and The Lion King, Disney had high hopes. The public, however, was less than enchanted and the show closed. 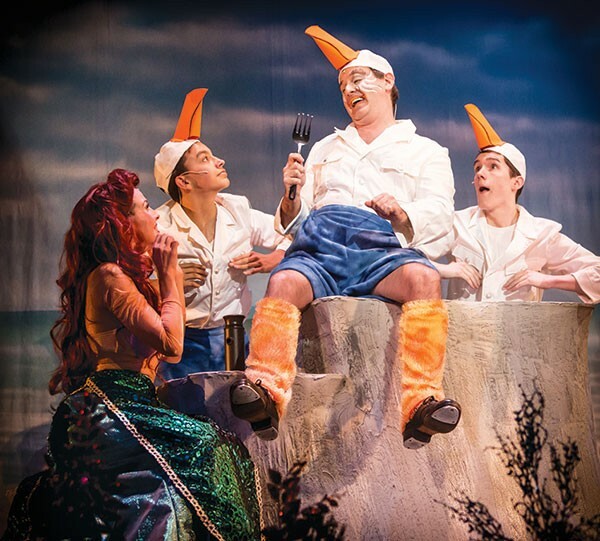 In 2012, a retooled version premiered in the Netherlands; the audience response was more hospitable, and this is now the Little Mermaid produced around the country. 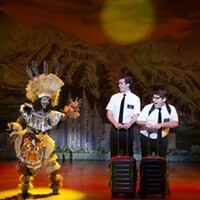 Though a few national tours have made their way to our fair city, this Pittsburgh Musical Theater outing is the first locally sourced production. Director Colleen Petrucci and musical director Melissa Yanchak have, all things considered, put up a very solid and respectable Mermaid. Kim Brown has come up with some fairly eye-popping costumes, though I will say that spending a bit more on the set could pay bigger dividends than what's on display now. But where Petrucci and Yanchak have outdone themselves is in showcasing some amazingly talented local singers. Larissa Overholt plays our heroine, Ariel. 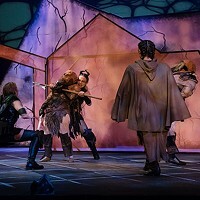 Much is made in the story about the character having a glorious voice, and Overholt's singing makes that the foundation of the show. Truth be told the character, not to say the script, is a little drippy, but Overholt's commitment to role and the astonishing voice she unfurls on these songs, written by Alan Menken, Howard Ashman and Glen Slater, manages to bring it all home. And speaking of drippy, Prince Eric — the love interest — is about as cardboard as the set ... even by Disney standards, where the princes are fairly shallow. But in the role, Tom Kolos strides the stage with a powerful voice and an unyielding sincerity. The show's never better than when Overholt and Kolos are going at it ... musically speaking, I mean. Scuttle, the goofy meddling seagull, is written for an old-fashioned song-and-dance man, and PMT is lucky to get Pittsburgh's personification of same: Jeremy Czarniak. Here's a guy who can sell a song and a gag like nobody's business. Tim Hartman's on hand with his own booming baritone as Triton, and Trumaine "Tru" Verret-Fleming is a lot of fun as Sebastian. I would like to re-emphasize the children's nature of the show; adorable little moppets are running up and down the aisles waving glow sticks and singing along with the performers on stage. But to complain that this is a hideous distraction (which it is) really misses the point. This production is designed for them, not the rest of us.